Day after day, I look forward to meeting one particular OT patient, who consistently gives me words of wisdom in such a way that I always smile and laugh. Being so quick-witted in spite of her circumstances is a fantastic quality of hers and it shows in her entire demeanor. One day, it made me think — I am constantly receiving good pieces of advice and hearing wonderful things from many of my patients, but why should I be the only one who benefits from them? It made me want to share the advice I’ve received with other therapists who may be in need of it. As therapists, we are always providing information to our patients. Whether it be regarding medical conditions, coping strategies, activity modifications, or strengthening programs, patients are given a plethora of information during therapy sessions. However, there is not always the chance for patients to impart their own wisdom. Patients may share stories or experiences during therapy sessions, but this is highly dependent on the practice setting. For example, this might be more common in hand therapy where there is more personalized time spent in a quiet clinic setting, as opposed to a large rehab gym. It is especially important to gain a perspective on your patients, and certain information can only be gleaned through more individualized conversations. By interacting with patients outside the rigor of standardized assessments and productivity standards, a therapist can learn about the lived experience of their disease or disability, resources important to them, or simply hear stories about their family or friends. Often, simple conversations are the basis for developing an occupational profile, where a therapist explores a patient’s social history, preferences, routines, primary and secondary contexts, patterns, habits, and values (American Occupational Therapy Association, 2017). The bits of advice I’ve received from my patients can be interpreted in various ways, and I will elaborate on my interpretation of them. However, the bullet headings are verbatim gems of wisdom from my patients. Have infinite patience. Patience is a virtue and, for some, it’s the last virtue left, so hang onto it. They do say patience is a virtue (especially when dealing with patients). Anyone in the service field can attest to how important patience is in controlling emotions each day. There will undoubtedly be patients you dread treatments with due to problem behaviors, difficulty engaging, or simply taxing personalities. Having a healthy dose of patience, and good coping skills afterwards, will help you get through the day. As for patience being the last virtue left, this can often be seen in unvirtuous therapy practices involving poor ethics, inaccurate documentation, and fraudulent billing. By keeping patience with others around you, and yourself, you will be more likely to stay true to your beliefs and do what is best for everyone involved in the therapeutic relationship. Everything changes. Think of the universe, and how it changes every day. Have an open mind. Change is one of the constants in therapy. Things will change within rehab departments, resources, schedules, facilities, practice standards and (hopefully) within our patients. Occupational therapists are known for their ability to adapt to differences in routines and think quickly to ensure a smooth transition for themselves and their patients. Having an open mind will allow the therapists to experiment with whatever works best for those around them. It will also encourage patients to be more open minded as a result of the assurance provided by their therapists. By being more flexible, not only in your thinking but in your actions, you are assisting yourself and those around you in feeling more comfortable with anything that comes along that day. And in therapy, it truly can be anything! There is a lot you don’t know, and a lot to still be discovered every day. This sounds like encouragement for lifelong learning. There are so many new advances in the worlds of therapies, medicine, and technology, with more evolving each day. By continuing to learn and stay informed regarding new practice standards, assistive technology, treatment protocols, and medical conditions, you can continue to use best practice with your patients. This can also help you to remain as confident as possible in the treatment you are providing, ensuring adequate reimbursement for therapy services. Finding new information regarding a variety of clinical skills and treatments can assist in providing the best care possible. Don’t take your personal agenda out on someone. It doesn’t make their life any better, and it doesn’t make your life any better. This is sound advice for any situation. I relate this to the concepts of transference and countertransference which can arise in a range of settings, not just in mental health where they are traditionally thought of. Transference is when a patient projects their feelings towards an important figure in their lives on their therapist (Reidbord, 2010). These feelings are usually negative emotions and can have an impact on the therapy process. Conversely, countertransference refers to the emotional reaction of a therapist toward the patient’s transference (Reidbord, 2010). It is not always possible to prevent transference from a patient, especially since many traumatic experiences can manifest in this way. Coping skills, behavioral management, and cognitive behavioral therapy can assist in managing transference when it does arrive. As mentioned earlier, countertransference does not make a patient’s life any better, nor does it make a therapist’s life any better. If it is significant enough, it can interfere with therapy sessions and even prevent patients from meeting their goals. Therefore, the presence of countertransference should trigger some self-analysis in a therapist to ensure its effects do not bleed into the progression of therapy. Do what you like. That’s it. Hopefully the field of occupational therapy is what you like and you are happy in your career choice. But obviously we can’t only do what we like and nothing else. It is only expected there are some mundane tasks to accompany any good thing. For example, even the most fulfilling job comes along with its share of paperwork and meetings which take you away from solely patient care. However, the basis of this advice is important. Are you doing work you like? Thankfully, occupational therapists have a multitude of options for career settings so, if you are not feeling particularly satisfied in your current role, there are other avenues to explore. Picking a specialty area can improve the quality of the work you do, as you will likely put more effort and creativity into your work each day. Even outside of work — are you spending time doing what you wish to do? Work-life balance is integral to happiness and quality-of-life, so it will be difficult to feel engaged and productive at work or at home without it. Taking time to do what you like may even help the mundane pass by quicker. Enjoy the world a little bit, before you settle down into your nine to five. I hear Europe is still there! This reiterates the importance of work-life balance and enjoying the things around you (or things far away from you) while you can. Vacations or even small trips are a lot harder when you are employed full-time, enrolled in a post-professional program while working, or are working multiple jobs. Responsibilities can seep in quite quickly at any point in your career, so being able to take a step back and reward yourself for your accomplishments is important to keeping yourself headed in the right direction. Even small rewards can make you feel better. As for someone right in the middle of their career or a new graduate: you never know when you will have the time to relax and reward yourself again so take the chance when it arises. Also, I have asked around and verified that Europe is, indeed, still there. Listen first. Then honesty both ways. Meet their needs if you’re capable of doing it. Listening is a large part of being a good therapist. Taking your patients’ feelings and needs into account will truly shape the way they respond to therapy. The importance of listening cannot be understated. Honesty is important in any relationship where people are working closely. Communicating openly back and forth will be important for how comfortable a patient feels with you. Therapists can often work on sensitive topics, and having a good comfort level with your therapist will be important for full engagement so patients can reap maximum benefits of therapy. If you take the time to listen and make their requests a reality, it will have a positive impact on their willingness to continue working with you and giving their best effort in treatment. This will form mutual respect between both parties. Focus on the senses (they’re all around you). Be friendly, social, and fun. OTs can use their education in sensory techniques, which can be of use in many ways throughout their practice. Sensory techniques can be incorporated in almost any setting and can be used on any patient with problem behaviors, or the patient who simply refuses to engage in therapy. Conversely, it can serve to help therapists as much as it does patients. 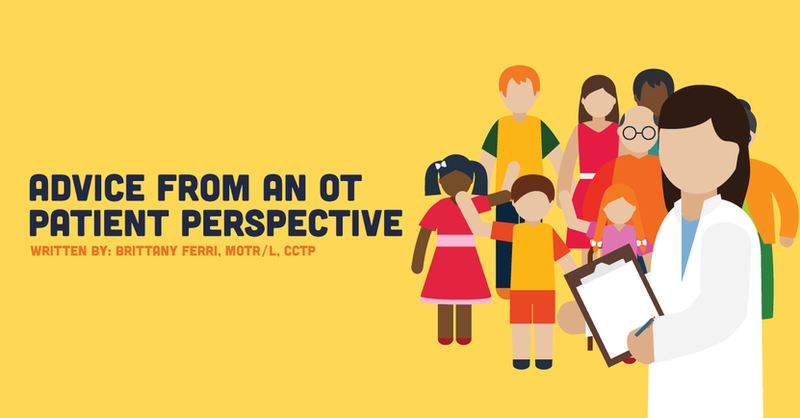 From choosing or structuring their own environment to decrease stimulation and promote success or providing ways to increase their arousal when they are experiencing low energy, OTs have a wealth of knowledge to help themselves succeed in any setting. Being friendly, social, and fun can refer to interpersonal modes within the therapeutic relationship. Gathering feedback from a patient before deciding on an activity or formulating a goal makes therapy more interactive and fun by incorporating patient needs using the collaborating mode of therapy (Taylor, 2008). Providing praise or reminders of patients’ strengths uses the encouraging mode of therapy, assisting a therapist in connecting with their patients (Taylor, 2008). Make yourself miniature so patients can have a compact therapist wherever they go. I believe that is salient advice for any therapist or patient who wonders if skills and strength will be maintained after their discharge from therapy. Preparing your patients for discharge to the best of your ability will be just as important as the therapy plan of care itself. It is in the best interest of the patient and the ethical responsibility of a therapist to do all we can to prevent reoccurrence of an illness or symptom. Ensuring patients have clear instructions for home exercise programs and have demonstrated competency, reviewing wellness plans one last time, educating caregivers again on proper transfer techniques, providing your patients with adequate resources so they can obtain help if a crisis situation arises. These are all ways you can ease the difficulty of discharge transitioning. When the above concrete steps fail to reassure your patients and they remain anxious about discharge, encouragement is a good therapeutic mode to utilize. By reminding your patient of their capabilities, it will reinforce all they accomplished during therapy. Even better, if your patient provided you with some wisdom along the way, thanking them for your time together and their words of inspiration can serve as an encouraging reminder of their innate knowledge. What is your favorite piece of advice from a patient? Let us know in the comments! American Occupational Therapy Association. (2017). Occupational Therapy Practice Framework: Domain and Process, 3rd edition. American Journal of Occupational Therapy, 68, S1-S48. Reidbord, S. (2010). Countertransference, an overview. Retrieved from https://www.psychologytoday.com/us/blog/sacramento-street-psychiatry/201003/countertransference-overview. Taylor, R. R. (2008). The intentional relationship: Occupational therapy and use of self. Philadelphia: F.A. Davis Co.